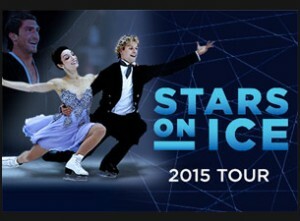 By the middle of March we’re sure you will be ready to beat the midwinter doldrums and what better way than to catch the 2015 Stars On Ice Show! This years show is “Dancing For Joy”…and what a joy it will be to see such stellar talent bring it all to life. Two of the most exciting stars will be 2014 Olympic Ice Dance gold medalists Meryl Davis and Charlie White, who mesmerized fans around the world with their near perfect performances. Included in the cast will be 2010 Olympic Gold Medalist Evan Lysacek, 2014 Olympic Silver Medalist Patrick Chan and two-time Olympic Pair Gold Medalist Ekaterina Gordeeva. Two great Ice Dance teams, 2014 Olympic Gold Medalists Davis & White, and 2006 Olympic Silver Medalists Tanith Belbin & Ben Agosto, will round out an already superb group of skaters for this show.